Tennis legend Martina Navratilova believes Ash Barty has the game to beat Petra Kvitova in the Australian Open quarterfinals - but only if she handle the Czech's venomous slice serve. Martina Navratilova says Ash Barty must nullify Petra Kvitova’s serve if she’s to book her first Australian Open semifinal berth. 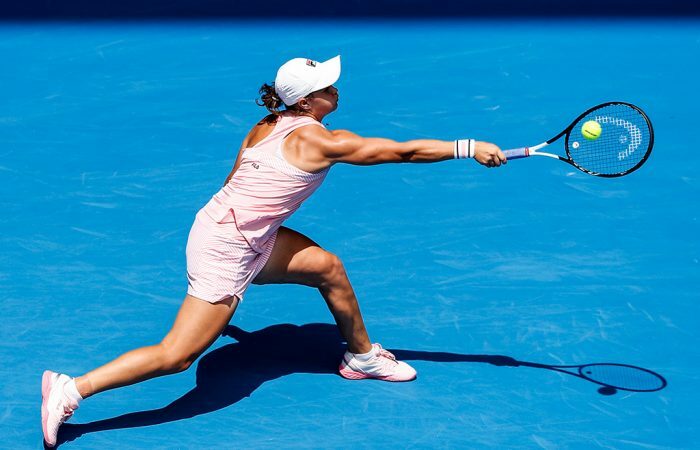 Barty carries the hopes of the nation on to Rod Laver Arena on Tuesday night when she bids to become the first Australian woman in 35 years to reach the Open semifinals. Navratilova, who includes three Australian Open titles among her Grand Slam singles title haul of 18, says the 15th-ranked Barty has the game to trouble Kvitova, the world No.6 and two-time Wimbledon champion. But she believes that’s only if Barty returns well against the classy left-hander, who has beaten the Australian in all three previous meetings, including in the Sydney final 10 days ago. They've had some battles over the years, but no previous match between @ashbar96 and @Petra_Kvitova has come as big as this. In her fourth-round win over young American Amanda Anisimova, Kvitova could hardly miss, on target with a stunning 86 per cent of first serves and winning 83 per cent of those points. Navratilova said that was the danger zone for Barty. “Ash needs to take away that slice serve and not get beaten there but the way Petra served the other day it’s going to be a hard one,” Navratilova said. “She served great, she played great and the match is on Petra’s racquet – she’s got the game to beat just about anybody when she’s on. Navratilova wants to see Barty come to the net to take time away from Kvitova, who has been ranked as high as world No.2. The tennis legend says Barty’s old-style game, mixing up her big groundstrokes with net placement and a mean slice, is a winner. “That’s they way of the future,” Navratilova said. “Everyone hits a great ball so now the next step is someone who can come to the net and knock the ball away at the net, especially on the faster courts. Barty, who will also crack the world’s top 10 with a quarterfinal victory, or Kvitova will earn a huge opportunity to make the Open final. The victor will play the winner of Tuesday’s other quarterfinal between unseeded players Danielle Collins and Anastasia Pavlyuchenkova. The last local to reach the women’s Open semifinals was Wendy Turnbull in 1984 but Barty is embracing her time in the spotlight rather than feeling any pressure. “Playing in Rod Laver (Arena against Maria Sharapova) was pretty spine-tingling really.